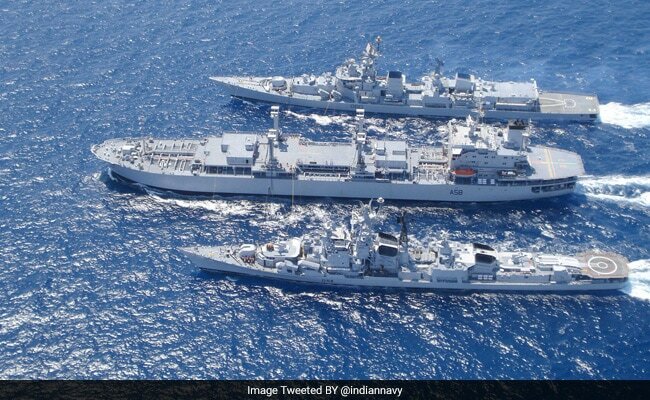 New Delhi: The Indian Navy began a joint maritime exercise with the French Navy on Monday at the Mediterranean Sea to further deepen combat coordination between the two navies. Guided missile destroyer INS Mumbai, stealth frigate INS Trishul and fleet tanker INS Aditya are taking part in the 'Varuna' exercise which will continue till April 30. The ships are part of the Indian Navy's overseas deployment to the Mediterranean Sea and West Coast of Africa and they arrived at Toulon port on southern France's Mediterranean coast earlier on Monday. The 'Varuna' series of exercises began in 2000 and have grown into an institutionalised form of interaction between the two navies. "The current visit seeks to underscore India's peaceful presence and solidarity with friendly and like-minded countries towards ensuring good order in the maritime domain and to strengthen the existing bonds between India and France," navy spokesperson Captain D K Sharma said. Interestingly, the exercise coincides with the visit of Vice Admiral Girish Luthra, Flag Officer Commanding-in-Chief Western Naval Command, to France. Luthra is scheduled to visit the French frigate FNS Auvergne, a French nuclear submarine unit, as well as an underwater weapons facility. He would also call on senior officials in France, including Vice Admiral Charles-Henri du Che, Commander-in- Chief of the Mediterranean Sea Area (CECMED). The visiting ships are a part of the Indian Navy's Western Naval Command. Defence cooperation between India and France has grown substantially in the recent past. Bilateral exercises such as 'Garuda', 'Shakti' and 'Varuna' have been a regular feature between the two nations.